The journey of Tabitha’s one-of-a-kind dress was such a fun experience and we ended up with something so unique and perfect for her… and very different from the original inspiration we started with! As an interior designer Tabitha is very creative and was involved with every stage of the process from design through to fabric sourcing and final details. 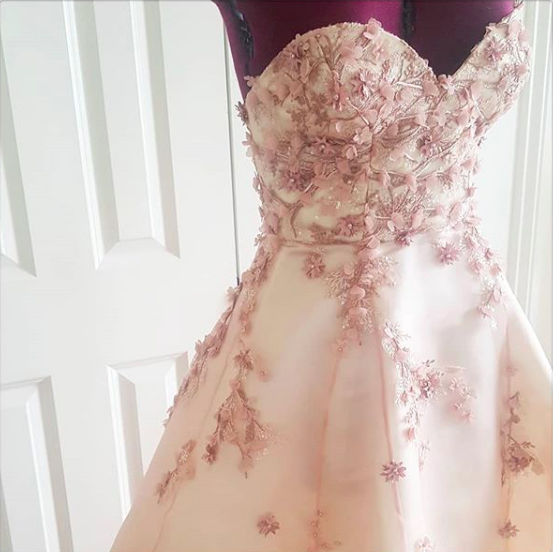 She told me at one point that she loved pink and was always trying to sneak it into her work so it wasn’t a surprise we ended up with this gorgeous pink organza floral dress! Eleanor married Rafi in a sensational sequined & tasseled bespoke 60's inspired dress. We had so much fun working on it together and she couldn't have looked more beautiful on the day! One of Eleanor's main criteria was to be able to dance and this dress really came to life on the dance floor with the tassels creating some serious movement and drama! I was so excited to see their gorgeous wedding featured on Rock my Wedding. Angela told me from the very beginning that she was a magpie- drawn to anything that sparkled! Together we found a beautiful glitter lace and mixed in flowing panels of chiffon for some added romance. Her dream dress was finished with a hand beaded green and silver belt to match the ring her fiancé Rob had designed for her. Such a lovely and personal touch. Their amazing festival wedding was full of fun and colour and matched their personalities perfectly. I was so excited to see Angela and Rob’s amazing wedding featured one of my all time favourite’s Rock ‘n Roll Bride! Lizzie opted for a simple design which let the fabric do the talking, a gorgeous white Chantilly lace layered over a fine, off-white crepe de chine. The figure hugging shape showed off her curves perfectly with a low back showing just the right amount of skin. The look was finished with a long single layer veil and huge smiles all day long. Her Isle of Wight wedding to Ben was lively and emotional in equal measures... the pair make an absolutely gorgeous couple. Mollie opted for an original 1950s lace dress which needed some attention! We repaired and relined it as well as adding some quirky details to bring it up to date . As Mollie was so young we wanted to give it a more playful feel and so opened up the back and neckline and added a bow fastening. I love these dramatic photos of her windswept Cornwall wedding day! Where it all began! Clare was the first ever Poppy Perspective bride and I have so many great memories of working with her. She opted for a bespoke two piece with a crepe and chiffon layered skirt and lace and crepe blouse. Simple and elegant, it was the perfect choice for her. Her Bristol wedding was a blast and it was such an honour to be invited to be there on the day! Gorgeous bride Nadja's dress evolved and changed at every step of the journey. We started with just a simple satin slip dress to which we later decided to add a lace bolero with back button fastening and later still a full lace overskirt. The Cathedral veil with matching lace trim was the finishing touch.